Steve Lazarowitz is an animal lover, a stepfather, an origami enthusiast, a hiker, a lover, a husband, a movie buff, a game-player, an amateur entomologist and a writer though not often all at the same time. He currently lives in Tasmania with his wife, two stepsons, an insane dog and a giant spiny leaf insect. "Life is my major influence. I've lived many lives within this one. As a retail store manager, an amateur entomologist, a tarot reader in a tea room. From Brooklyn, New York to East Peoria, Illinois to Fresno, California to Moonah, Tasmania, I have traveled. I've crossed the country by car, plane and train at different times of my life. I've been to Costa Rica, the Cayman Islands, the Bahamas, England and now Tasmania, Australia. How can anything not influence an author? I've been reading speculative fiction all my life. Here are some of my influences... Roger Zelazny, Piers Anthony, Lord of the Rings, my fifth grade teacher, my dad, Rod Serling, Star Trek, Knight Riders (NOT the television series), Calvin and Hobbes, WWF Wrestling, The Bronx Zoo, the American Museum of Natural History, the Smithsonian, managing a computer store, two divorces, three marriages, five sisters, my friend Paul, the women I've loved, the games I've won and lost, countless movies, books and television series, the few times I've stared death in the face, the few times I got away with things, the many times I've paid for them, Styx (the rock group not the river), Zen (my pet savanah monitor lizard), Juanita (my pet amazon parrot), my step-daughter, my stepsons, my living reef tank, Josh Miller, who saved me by dying, the New York Yankees, September 11th, my father's death, writing full time, the time I killed a bird that was suffering. What hasn't influenced me?" 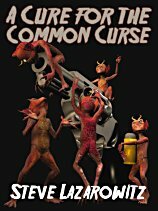 A Cure for the Common Curse Ebook Fantasy/Humor Tag line: Evil just got a whole lot funnier. 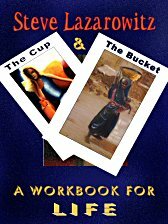 The Cup and the Bucket: A Workbook for Life Ebook New Age/Spiritual Tag Line: A practical guide to living a new age life in a young soul world. 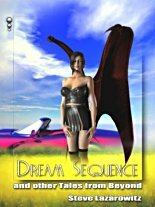 Dream Sequence and other Tales from Beyond Print Anthology Tag Line: Think at right angles to reality. Fantasy Cereal Print Fantasy Tag line: Adding milk to this volume will void your warranty. 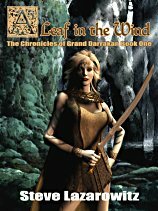 A Leaf in the Wind Ebook Fantasy Tag line: Sometimes you have to die to beat the odds. Blurb: Kestryl, the Bladesman of High Gondylar, has every reason to believe Penthor, the heir to the Gondylarian throne, has committed treason. Yet, Penthor’s assassins have failed and Kestryl sets off on a long journey to find Cyanne, the true heir to the throne. Exiled at the age of five, Cyanne is now a young woman and could be anywhere. Even if he finds her, Kestryl has no idea what she might be like, or whether she will choose to return to the Great Dukedom. Neither Kestryl nor Penthor know the face of the true enemy, a powerful sorcerer who has managed to turn the two most powerful men in High Gondylar against each other. And no one could have prepared themselves for Tanrif, an outlander whose own destiny will affect not only High Gondylar, but will change the face of Corithim forever. 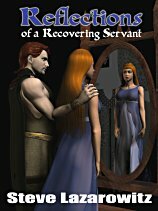 Reflections of a Recovering Servant Ebook Fantasy Tag line: A servant's life can be more dangerous than a knights. Alaric Swifthand Ebook Fantasy/Sword-and-Sorcery Tag Line: Never has a hero been less prepared to save the day! Blurb: Conan had strength, Arthur had Excalibur, Rambo had guns--Alaric Swifthand has an uncooperative magic sword, which doesn’t seem to be any help at all. How could an ordinary guy possibly get into so much trouble, and why does it keep happening to him? The answers may surprise you. Never has a hero been less prepared to save the day! 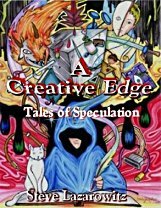 A Creative Edge: Tales of Speculation Ebook Speculative Fiction Anthology Tag line: Learn to think all over again. The full definition of a serial is any continual publication appearing under a single name, separated from its brethren by a volume number. According to this definition newspapers and magazines are serials. This is not the type of serial I'm talking about. I'm thinking along the lines of the old science fiction serials like Flash Gordon, Buck Rogers, or even radio serials like The Shadow. Today, many authors offer their works in a serial format, revealing one chapter at a time. This is not what I mean when I talk about a serial. What I call a serial isn't merely a story broken into sections; it is a deliberately structured piece of fiction--fast paced, action oriented and filled with twists, turns and cliffhangers. I've had three serials run on the Internet over the years. In fact, my very first work to be displayed on the Internet was The Adventures of Alaric Swifthand . If some of the names of the serials look familiar, it's because I often add to serials and republish them as ebooks after they've run their course. Tag Line: Never has a hero been less prepared to save the day! Alaric debuted on October 7, 1997 on a page called Dragonsclaw--a role-playing game page. I had visited the page on a friend's recommendation. It offered gaming news and reviews in a functional but unappetizing manner. I felt the page would be more successful if it had something that drew people back month after month. Naturally, that meant having something by me on the page. I emailed the webmaster with the idea, who asked to see a sample of my writing. At the time I worked in a computer store in Brooklyn, New York. 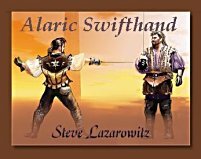 As soon as I received his email, I sat down and, off the top of my head, wrote the very first part of The Adventures of Alaric Swifthand . I hadn't plotted it at all; I just wanted to give the webmaster a sampling of what I could do. A few minutes after I sent it off, he emailed me back wanting to know what happened next. I told him if he wanted to find out, he'd have to host the serial. So, Alaric Swifthand was born. We agreed to a six issue test run. I started writing. The problem was, I wrote myself into a corner by creating a murder mystery without any possible solution. At least no satisfying one. There I was, writing on the fly, often finishing an installment the day it was due, with no idea at all of how to end it. When I wrote part five, I still didn't know. Part Six was hailed as brilliant by most of my readers, but it wasn't careful planning they were seeing; it was last-minute desperation. I received so much fan mail for Alaric that the webmaster asked me to continue the story. Book Two of Alaric Swifthand ran seventeen installments, right up to part twenty-three. Then, in November of 1998, more than a year after its debut, the last episode of book two went up. Amidst some small protest, I retired Alaric, at least for the time being. 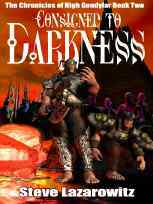 Later, when I became involved with epublishing companies, I wrote Alaric Book Three, combined it with the first two and released it, first from Crossroads Publishing and later from Twilight Times Publications, where it resides today. Alaric is still available as a download and is also available in print as part of Fantasy Cereal , a two-novel trade paperback from Zumaya Publications. Alaric Book Four is started, but it will likely be a while before I find the time to complete it. Tag Line: Being a servant can be just as dangerous as being a knight. While browsing around the net one day, I chanced upon a page called Trolls Eye Reviews. The site was looking for content to review, so I took a chance and sent them the information about Alaric Swifthand, which was still running at the time. I received a very nice review from Trolls Eye (my first review), and Jason Laseman (the owner of Trolls Eye Reviews) and I became friends. Later, when he told me he was planning on starting an online zine of his own, I was anxious to get involved. I offered him another serial. It came to me while I was talking to him about it, and by the time the conversation was done, Reflections of a Recovering Servant was born. Unlike Alaric, I had a fair idea of where this one was heading (even though it still managed to surprise me from time to time). Reflections debuted on April 1st 1999 in The Wandering Troll Ezine. It ran thirteen installments, the last of which was posted to the site on March 1, 2000. Reflections was a far more ambitious serial than Alaric, and to this day remains one of my favorite stories. It's also worth mentioning that my wife discovered the first issue of Reflections online two days before we met in a 3D chat program. If that's not fate, I don't know what is. Tag Line: What happens when the veil between worlds no longer exists? Confronting the Void is the serial that took me the longest to write. I began it sometime during my second marriage, but never found a page to host it, and so I lost interest. In truth, I love the idea of writing on the fly, being forced to meet that deadline. Admittedly, I didn't try to push it very hard, possibly because it was science fiction and I was far more comfortable with fantasy. After a divorce, and a transitional relationship that lasted three years, I ended up moving from New York City to Hobart, Tasmania, where I reside to this day. I finally decided to find a home for Confronting the Void and I did--a site called The Writer's Hood, which I'd had dealings with before. Again I ran into a problem. I had had, at some point, an idea of where the serial was going. I could no longer remember my plans. I had to start mid-story and figure out what was going to happen. When I failed, I took the story in what was almost certainly a new direction, though I love the way it came out. 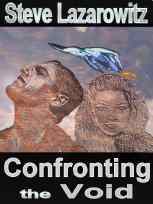 Confronting the Void has one of the most twisted plots I've ever conceived, which in my book makes it okay. The Writer's Hood had problems staying with a schedule (even though I was always on time), but eventually the entire thirteen installments were posted. I've since contracted Confronting the Void with booksforabuck.com, and expect it to be available as an ebook in the not too distant future.